I acquired a review copy of Humpty Dumpty Was Pushed for the very purpose of reviewing it for the Unreliable Narrator. It’s not a book I would generally buy. Meaning, I don’t read police procedurals, which this is. Sort of. And I certainly wouldn’t have picked it up based on the sleeve, which touts Marc Blatte’s first novel as “…the first truly wonderful hip-hop noir mystery” with comparisons to Tom Wolfe and Carl Hiaasen. Humpty Dumpty Was Pushed is a fast-paced who-done-it that barely slows to consider its shortcomings (more on that later). It’s a mostly believable tale of a cop, Black Sallie Blue Eyes, out to find the murderer of a night club bouncer. The story unfolds by introducing a group of initially disparate characters, many accounting for multiple points of view. The effect of multiple narrators is distracting at first, but eventually Blatte falls into a rhythm that at least stopped me from asking, “Why all the different points of view?” It’s a choice, and the author went for it. It gives the reader the benefit of getting into the heads of the major players in the story. But the down side is that the inner life and motivations of Black Sallie Blue Eyes, alternately called Sal and Sallie throughout, become watered down. I would have liked to see much more from Sallie’s point of view. Blatte’s author bio says that he’s currently writing another mystery featuring Sallie. I’ll be curious how he handles the point of view thing in the next one. Anyway, so where does the hip-hop come in? Chapter 1 is told not from Sallie’s point of view, but that of Biz, a rising-star rap producer and cousin to a scumbag gangsta named Scholar. Scholar insists that his star cousin produce a demo for his rap group, Proof Positive. Biz relents when Scholar amazingly comes up with 15K, the high price Biz quoted his crazy cousin thinking he’d never actually scratch the cash together. Where did he raise all that cash? Biz’s favor for his cousin (he’s rightfully scared shitless of Scholar) sets off a series of events that turn up the body count. Word. Chapter 1 did not grab me by the short hairs and scream, “Read the rest of this book!” The point of view shifts between Biz and Scholar. It’s Biz’s chapter, if we want to nit-pick (and, oh god, do I), although Biz only shows up two or three more times in the book. Next we are introduced to Sallie (“one of New York’s most decorated cops”) and his crew as they investigate a murder in the parking lot next to the Manhattan club all the rappers and high-rollers love, the Kiki Club. The dead body belongs to Pashko, a former Serbian gun runner, come to America to escape the drama and share an apartment with his cousin, Vooko. Turns out Vooko was with Pashko when he was shot, barely escaping a hit and run that left him in the hospital but with a clear memory of who killed his cousin. The chapters are short, which lends to the quick read. The choice of shifting points of view, while initially off-putting, ultimately adds breadth to the storytelling. Both Sallie and Vooko are looking for Pashko’s killer. The lens of the story widens as we discover that a few altercations occurred at the Kiki Club, one involving Scholar and his crew, and another with rich white boy Kal Kessler, and his sister, Leah, the spoiled spawn of ultra-rich New York developer, Sheldon Kessler. I suppose this is where the Tom Wolfe comparison comes in, with the depiction of the haves and the wanna haves. Vooko and Scholar both come from nothing and want the lifestyle on display in the Hamptons, only a car-drive away. If murder is a way out, than so be it. I’m not the target audience for this book. I don’t read a lot of police procedurals or watch CSI and Law & Order. But that doesn’t mean I don’t enjoy a good plot-driven read. Or can’t spot unbelievable characters or situations. Scenes of Sallie’s detective work seem the most plausible and are among the most interesting to read. Vooko’s character is flawed but comes across as curious but mindful. He has his own dangerous agenda, but in his chapters we are shown his struggle to forget the atrocities he witnessed in his home country and his determination to find his cousin’s killer and right his world. The book’s title is his mantra: Humpty Dumpty didn’t just fall. Murder doesn’t just happen. Mr. Dumpty was, ultimately, pushed. Sections that work best include a scene where Blatte takes us out of the city and drives to the Hamptons with Vooko in his search for justice. His longing for a mansion and a garage full of classic cars is well conveyed, his dream making him come across as a hopeful innocent. We know Vooko will probably never achieve that kind of life, but it’s his determination for what he sees as the American way that makes him endearing. When Sallie visits the drugged-up Kal in his renovated Tribeca loft (one of his father’s projects), Sallie stares out the window, down into the hole where the Twin Towers once stood. He feels nausea remembering that day and how he lost friends in the attacks. This sort of emotion in the context of a murder mystery seemed like a convenient trigger for a jaded character to get more angry and depressed. But it’s later, when Sallie comes back to Kal’s place for a deadly face off, that the area out the window evokes tears and a true reflection of evil. It’s a heartfelt moment, welcomingly downplayed, that echoes more realistically the earlier scene’s sentiments. These moments explain more about what drives Sallie than any other passages in the book. Occasionally, though, Blatte makes some astoundingly odd choices. Some of the action scenes are written in a bloodless, distancing style. For example, toward the end, one of the characters is racing through Manhattan streets. The scene ends in a fiery car wreck. Instead of a satisfying description of the crash, we get this: “The collision was fast and furious; a case in point that drugs and driving don’t mix. The outcome was predictable. How could a prissy little BMW sports car plow into ten tons of steel loaded with five tons of garbage and remain intact? The answer: it couldn’t, and neither could its driver.” What really happened? Give us real-world detail. Like, what happens when this particular BMW ‘plows’ into this particular truck? The collision was ‘fast and furious’, the outcome ‘predictable’ – this doesn’t tell us much, and shows us even less. Another misstep is to include a scene at the very end, where Scholar explains his dastardly actions, articulating his ideas in language that had until now eluded him. If Scholar was indeed some kind of scholar, as this scene implies, we need to see it throughout the book. His interior monologue, shown in chapters from his POV, never hinted at this type of self-awareness. Also, as a reader I didn’t need or want such a concise, pat explanation for his character’s motivation. It’s like the end of Hitchcock’s Psycho, where a new character is introduced in the final ten minutes to give a long-winded explanation about Norman Bate’s motivation. It’s a matter of balancing, and Blatte hasn’t quite worked out what degree of importance to give certain details. Overall though, Blatte introduces an interesting bunch of characters and situations. He has a decent ear for dialogue, and basically gets out of his own way to let the Vookos, Scholars, and Kals of his New York duke it out. So if you want a quick read, a fast ride, a book that doesn’t take itself too seriously, check out Humpty Dumpty Was Pushed, out now from Schaffner Press. It is interesting to read your book reviews. They are well written, colorful, fair, and witty. This one is extra delightful. Just finished the book. Found your review well written, beautifully laid out and interesting, especially your point about the shifting POV. 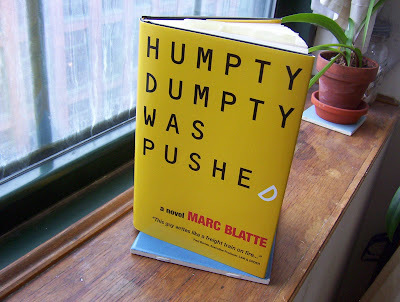 The multiple POV worked for me because it gave Humpty a forward momentum that I really enjoyed. The book is after all fast paced and quite good humored. Not unlike your review. Hi Liz's mom, thanks for reading. Hambonebro, very nice comment. Thanks for stopping by. Interesting review, I am thinking of picking this book up myself, got to add it to the long list of books I hope to read.